Chad, Laynie and Gill Sears carry on family tradition, ranching on the Cheyenne River in Wyoming. Drive south down Lynch Road from its Wyoming Highway 450 intersection between Newcastle and Wright. Follow the twisting, turning pink gravel 15 miles or so and you'll sight a tree line in the lower elevation distance. You suddenly come to the edge of the world there, falling down off the ridge your road's been following, headed straight into the Cheyenne River and the bridge that takes you around a bend to climb out of Weston County and into Converse County. You're on the historic 4W Ranch, roughly 29,000 acres of deeded and leased land that's home to a six-generation ranching family and their 500-600 mostly Red Angus cows, some high-quality Red Angus and Charolais bulls, and their offspring. Watch out, the roads aren't fenced, and cattle hang out there. And don't go to that bridge, but turn east at the "4W RANCH" sign. Keep takin' right forks, don't stop 'till that road ends, and you'll be at the historic headquarters of one of Wyoming's oldest ranches. Some cottonwood's towering overhead and some logs comprising a barn, bunkhouse and blacksmith shop have known this outfit from day one . . . priceless history and traditions. 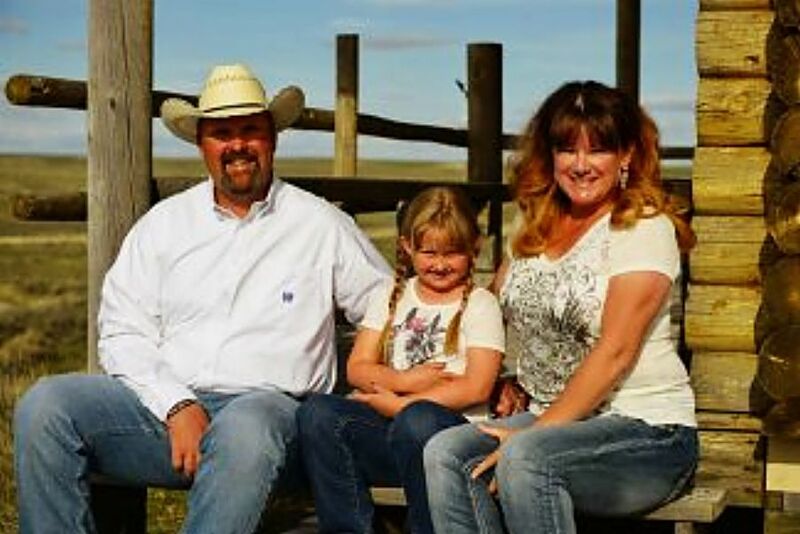 Any fifth-generation rancher living in their shadows has big boots to fill. That would be tall broad-shouldered Chad Sears, ably sided by his beautiful Scottish-bred working dynamo wife, Gillian, and their precocious 8-year-old home-schooled daughter, Maclayne Avery Sears (Laynie to her friends), who represents the sixth generation. 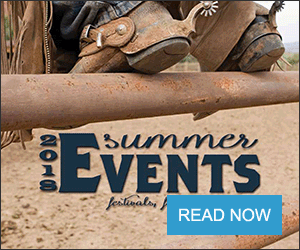 As part of the 4W Ranch Family Limited Partnership, their work-worn boots are perfectly at home in the Cheyenne River sand, among those historic landmarks. Get out and stand by Chad as his gaze caresses promontories, ridges and canyons beef cattle have grazed continuously since 1878. After he tells you, "Bein' out here is a good place for a family; the way of life is special and you love the land and the openness," you'll hear determination in the statement, "We hope to maintain strong traditional ranching values here, while mixing in the best of modern ranching techniques." That very idea was a 4W Ranch tradition long before Chad — or even his dad — were born. His great grandfather Gus Sherwin, introduced "ranching by airplane" and Charolais bulls to the 4W Ranch — two of the most revolutionary ideas possible in the 1950s and 60s. Nestled against the twisting banks of the upper Cheyenne River, not far from her headwaters, the 4W Ranch stood alone on 1880 maps of Wyoming Territory. Early owner and Longhorn rancher J.W. Hammond first branded cattle there with the 4W that names the ranch. In its heyday, guided by Texas-native foreman William Keating, the outfit carried 10,000 head of cattle. In 20th Century's early dawn a cowboy named Len Sherwin — born and reared in an innovative risk-taking family who helped "save the buffalo" of Colorado — thrilled fans with his traveling Wild West Show. Amid such distractions, Sherwin discovered the 4W ranch around 1920, was awed by its beef-producing prospects, and soon owned the brand and more than 30,000 acres there. His granddaughter Jean Sherwin (Sears) Harshbarger grew up on the ranch, put down roots, and lives/works there yet, third generation of the 4W legacy. Jean and engineering student Bill Sears met at the University of Wyoming in the mid-1950s. After becoming the first woman to receive a UW degree in agriculture, Jean married Bill and began raising the fourth 4W Ranch generation – Nicky, Tony and Elana. Gus Sherwin's accidental death on a Florida fishing trip in 1964 left Jean's mother Char alone with the ranch, so the Sears family moved back to help, allowing that generation to grow up there. After Char's passing in 1970 Jean and Bill managed the ranch until his untimely death in 1981. That dumped the whole load on Jean's shoulders, but with good neighbors and the competent help of her kids she managed it all — from drought to flood to her house burning down — raising and campaigning race horses and winning Old Timer's Rodeo Queen titles for diversion. Jean's only son, the late Tony Sears, was Chad's father. Growing up only an hour and a half from the 4W, Chad spent most summers and every other moment possible there, joining Jean to see yet another generation root down like her. Then, according to 4W legend, "a new set of wings dipped over the horizon in 1989" and Jean was swept into marriage with Illinois native Robert Harshbarger, Air Force Major, Ret. If that version of the legend doesn't suit you just ask Harshbarger — he'll tell you he "came to the 4W to hunt and got shanghaied." "The Major" enlisted in the U.S. Air Force at the start of the Korean Conflict, 1950, applying for and entering Aviation Cadets in 1952. Across two decades of service in the USAF Harshbarger flew more than 100 Combat missions in Vietnam in an RF-4C Phantom. Most were low-level high-speed reconnaissance flights, earning eight air medals, plus the Distinguished Flying Cross. And yes, Harshbarger's Navion is now part of the 4W, occupying the hangar Jean's dad Gus (a Bellanca distributor) built. The 4W Ranch is primarily grassland, but pilot Gus Sherwin bladed a strip near the house for a runway. That led to an adjacent alfalfa field, and now a few small fields of crested wheat or alfalfa can be found near the main headquarters. The original 4W Ranch was massive. Eventually the portion Jim Sherwin (Gus's brother) owned and operated sold to a neighboring rancher. That coming up for re-sale some years ago seemed like destiny. Jean and Bob, thoughtful of their age and future needs for help, purchased half the available land; thus restoring one broken edge of the old 4W. "It's hard to justify purchasing new property when you compare today's land values with beef prices," Chad said, "But if you're not growing you're dying. Gramma and Bob used wise foresight buying that, making it easier for another family to be incorporated into the ranch and make a go of it. In 2000, just after Gill and I were married, we came here for a visit," Chad remembers. "They approached us then, about moving here sometime to help, and eventually take over the ranch. They were laying plans, yet not quite ready so I re-enlisted, and we didn't move here until my 2004 discharge." Born and reared in Scotland, trained and employed working with the public in finance, Gill said, "Nothing prepared me for the vastness and solitude of the 4W, something I have come to appreciate and love dearly. I had horses before . . . but riding circles in an arena with an English saddle couldn't prepare me for the grit needed to chase down a wild cow or bull. Will and Rhonda Stearns were my mentors . . . and proved to me that I could do things that seemed impossible and somewhat scary. Knowledge passed to me, with humor and grace, from Jean always proves true . . . staying upwind of a cow relieving herself . . . the wise words that 'fences are just a suggestion.' all brought humor to my greenhorn education. My wildest dreams as a child in Scotland pale in comparison to this real life adventure." Chad, Gill and Laynie's home is on the river a few miles above the original 4W headquarters, well-located for the upper end spring branding. They have good horses, working dogs and a sweet set of pens and facilities for branding, and to manage those home-bred 2-year-old heifers through their first calving, starting in February. Scheduled night-rounds get closer together during cold snaps and storms, but calving problems are minimal. For years, Gill endured the drive (at least 30 miles of gravel road and 50 after reaching the pavement) to work a full-time job in one or another of the "closest" towns. Now she keeps even busier at home, devoting hours daily to Laynie's home-school program, then tying into riding, feeding, fencing, checking cattle, working with horses and the many other joys all ranchwomen share. 4W Ranch's beef herd was once colorfully eclectic — hardy, healthy, and happily acclimated to their range. Money follows trends, and livestock uniformity was in, so the 4W bovines began bending toward order in size, class and color. From an early-1990's calico mix of black, black-baldy, a moderate amount of red, plus a few Hereford, Dutch belted, and Beefalo crossbreds, that mob has transformed into very uniform size and shape with just two basic colors — the vivid henna/cinnamon/gingerbread glow of Red Angus and the ambiguous vanilla caramel/creamed coffee/rodeo dust of Charolais-crossbreeds. "Bob started the ranch down that road soon after he came here," Chad says. "There's been a huge transformation — and they're uniform — except for the few colorful misfits my wife loved from birth and I enjoy keeping for marker cows." The "calico cows" were big mama's. The 4W ideal is smaller-framed, lower-maintenance, with a weaned calf tipping the scale at a high percentage of her weight. "To keep our cows smaller we roll-over our heifer bulls into the cow herd and buy only what Charolais people consider 'heifer bulls,'" Chad grins. "We keep between 50-80 replacement heifers annually, so birth weight and calving ease maternal EPD's are important. The 4W's ideal birthweight is right at 70 pounds, and we have it right where we want it. They mostly just calve on their own, and that's really good." "We were in severe drought the summer of 2012, and desperate to supplement the cows. That's when I discovered Rio Max tubs," Chad said. "We switched from feeding cake, and it kept the cows going real well even in those conditions, plus weaning weights increased about 30 pounds. Another benefit with feeding tubs was not having to call the cows to cake, because that method caused a large portion of cows to expend more energy than I was giving them. "The greatest benefit," he said, "is when preg-checking the fall of 2012 — in spite of the drought — we had maintained a 90 percent breed back. 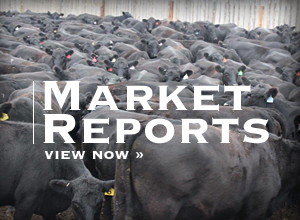 The last couple years it's run above 96 percent on the cows and around 98 percent on the heifers." Feed or no feed, there has to be water. "Water is ever so important to every ranch. The 4W has opted to drill water wells instead of installing pipelines," Bob said. "We now have 27 water wells throughout the ranch unit. Seventeen of these are pumped by solar power, which is very efficient, cost effective and requires minimum upkeep. When a windmill goes down, it is replaced by solar. New wells are always solar powered." Some 4W Ranch fences were built well over a century ago, and given the nature of hard natural cedar posts it's impossible to know how long a lot of them have served their purpose. Gill is the ruthless dynamo of fence repair, covering great distances hauling posts and wire on her ATV. "We just mainly try to get to the corners and re-do them solidly so there's something to stretch to," Chad said. Chad and Gill are also constantly repairing/replacing around both headquarters and another remote branding pen with continuous fencing. "You can get a lot of that up pretty quickly," he says, "It is very tough, holds cattle well, and doesn't cost any more than boards that break easily when a wreck happens." Octogenarians Jean and Bob are amazingly active, heavily involved in spring and fall work with the cattle, and trading work with their neighbors. Laynie heads to their place as often as possible so she and Gramma Jean can hike, explore, cook, play cards and visit. The little cowgirl has two horses, rides confidently on the ranch and in arenas, and won the Weston County Junior Rodeo Rookie belt buckle last fall. Her 4W family is even prouder that Laynie's fellow competitors in the Weston County summer Gymkahnas voted her in for the 2016 Friendship Award.